The entire book of Ecclesiastes has such a melancholic undertone to it that one ought to be surprised at the occasional, seemingly hopeful and encouraging verses that pop up in the midst of all the gloom and all the poetic realism. Yet perhaps what reads as a pleasantly joyful and hopeful verse on its own is not as simple as it is – as often the words of Solomon often are. Taking in the context, where the bleak, common destiny for all was very thoroughly explained as Ecc 9:3 – This is the evil in everything that happens under the sun: The same destiny overtakes all. The hearts of people, moreover, are full of evil and there is madness in their hearts while they live,and afterward they join the dead. Verse 10 goes a step further and hints at the real meaning behind verse 7 – Whatever your hand finds to do, do it with all your might, for in the realm of the dead, where you are going, there is neither working nor planning nor knowledge nor wisdom [Ecc 9:10|Article]. Even if we will end up with the same destiny, even if we will ultimately die and all that we have obtained in our lives would count for nothing, even if everything is meaningless – let us still live our lives with joy and pleasure, because it pleases the Lord. Go – I like this word, it is to me one of the greatest instruction and command ever, especially in the Bible. Every time the word is used in the Bible, there’s not only power, but also promise. In this context, this instruction perhaps only refers to the righteous, because the unrighteous wouldn’t need reminding to be joyful in their worldly activities, as perhaps it is only those righteous in the word that would grieve over the ultimate similar and bleak destiny of mankind, much as Solomon himself does. In the word ‘go’, Solomon gives relief and release from the loops of hopelessness and melancholy that he has cycled the reader through in Ecclesiastes – Go, despite what I’ve said. Go, on top of what I’ve said, you ought to be merry. 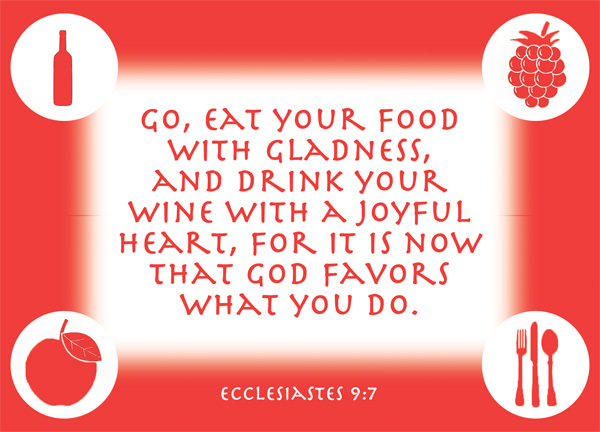 eat your food with gladness, and drink your wine with a joyful heart – go about doing your daily necessities joyfully! You can eat joyfully, even though you are a sinner. You can drink in pleasure, even though this life is temporary. Everytime there is joy, there must also be thankfulness – joy is one of the easiest reasons for us to be thankful to God. Yet, be joyful in moderation, it is really not the idea of – since we’re going to face the same destiny, let us all be crazy in this world. No, eat your food with gladness – there’s a sense of serenity and calmness in that. Lastly, eat your food, drink your wine – labour for your pleasures yourself. for it is now that God favors what you do – Think about it this way – who was the one who gave us our daily portion, our food and wine, our possessions, and all that we have? If you must, you can trace a long way back through a long list of humans, but ultimately, it is God. God freely gives out blessings, and God blesses us willingly and happily, I would think, with pleasures in life. If so, would God not be pleased if he sees us pleased with our blessings? No one is going to be upset when he gives a present and the person who has received it is happy, and uses it happily. Our joy in our daily lives pleases God. Remembering, even more so, that we are talking about righteous people, who by definition do good with love and faith even in their daily lives, we must therefore conclude that pleasures that are equally righteous are pleasing in God’s sight. Surely not sinful pleasures. Not food you’ve stolen. Not all that goes against the Bible. I’m sure you have parties on big occasions. For example, your son’s birthday? Or Christmas? Or New Year? As Christians we celebrate Christmas and party a lot in that season, but as Asians the real big occasion is honestly, the Lunar New Year, where you are obliged to go visiting relatives from close to distant and from distant to even further. You feast, you catch up, you make merry, and you have fun. You try to wear red or orange and try your best to follow all the customs that don’t contradict the Bible. Or at least, try to. For all you who celebrate Lunar New Year, or for all you who have a party coming up (we always should have parties coming up, no? ); I cite you this verse – and even if you disregard the somewhat gloomy context, it’s probably fine just for this time – Go, eat your food with gladness, and drink your wine with a joyful heart, for it is now that God favors what you do.